Dust - and explosive subject! Article in the Pulp Paper & Logistics Magazine, November 2012. "Pulp Paper & Logistics Magazine features the increased importance of logistics and how raw materials delivered to and products are shipped from mills to customers both on time and in perfect condition. Products handling and movement are vital in achieving the best results for both the mill and the customer". 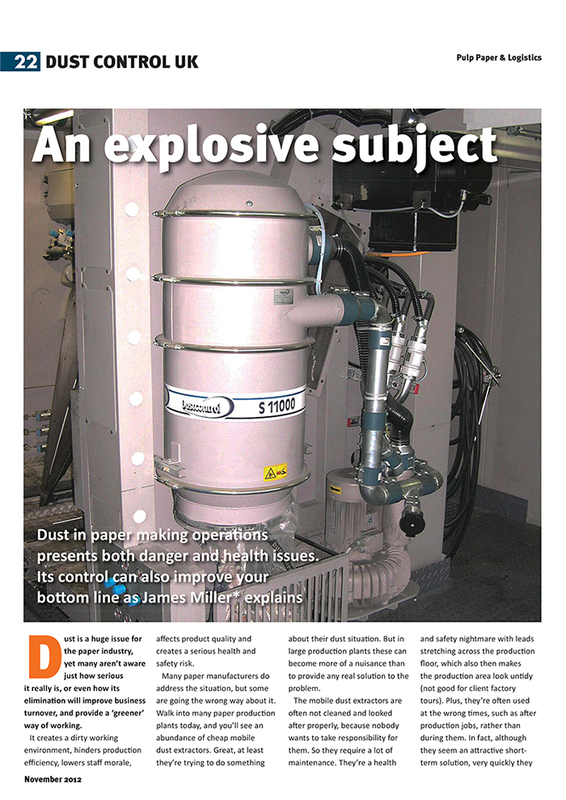 In the Pulp Paper & Logistics Magazine, November 2012 issue, Dustcontrol UK's article about how dust is a huge issue for the paper industry is presented. "Elimination of dust will improve business turnover, and provide a ‘greener’ way of working, James Miller, General Manager at Dustcontrol UK, explains".